This is the approach we follow in the WSO2 Mashup Server. Not only do we provide a platform for the last mile integration, with support for consuming Data Services, Feeds, REST and SOAP Services, but we also allow the newly created Mashup to be exposed as a service, which in turn can be consumed by others. Interesting read. With Facebook acting all paranoid all of a sudden regarding Friend Connect. it's good to know a bit of the internals at a glance. "Google will launch a new product on Monday called “Friend Connect,” which will be a set of APIs for Open Social participants to pull profile information from social networks into third party websites." Cool. Can't wait to get my hands on this one. Frikin awesome. I need one. Exteminate... Exterminate...!! 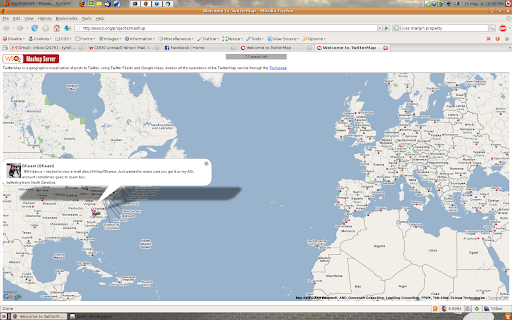 By the way, the base platform is the WSO2 Mashup Server, the Free and Open Source Mashup Server. If you want to learn how to make Mashups similar to these, register for the free Webinar by Jonathan Marsh coming up next week. A very informative review as usual. A Police Raid; Is Your Business Software Worth it? Well folks. It looks like the days of the "100 Rupee Window$ and Other Commercial Software" CD is over. 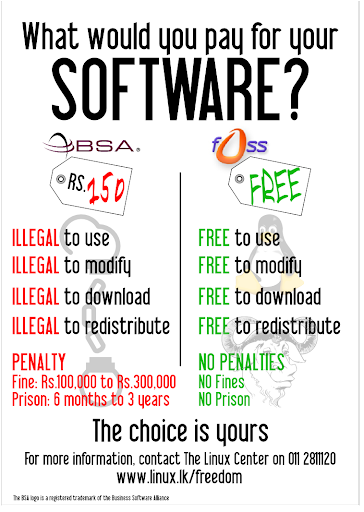 The Software Licensing Regime is here and it looks like through the Business Software Alliance or the BSA, it is here to stay. Remember those 3 letters, you will be hearing them a lot in the near future and one day they might even show up at the door of your business. I have been playing with Apache Shindig during the past weeks with mixed results, This is basically an Open Source implementation of the OpenSocial and Gadgets specifications by Google. Although the project is still in the Apache Incubator, support from Google will potentially mean that this might turn out to be the reference implementation for this type of containers. The container itself is pretty easy to integrate into a J2EE web application. However, apart from providing the infrastructure, there's nothing much for the implementer. There are a few samples, which were very helpful during the initial stages. But if you think integrating a Shindig container to your application will instantly provide your users an iGoogle like experience, be prepared to be disappointed. Maybe I was expecting too much. But it would have been nice to have some more functionality in the vanilla installation and samples to demonstrate those. So I finally decided to do the migration from Ubuntu 6.10 to 8.04 (see what I mean? almost a two year gap). My first stop was the Ubuntu 8.04 (Hardy Heron) release page and the .torrent file listed there. Having downloaded and burnt the .iso to a disc, I was ready to go. I usually keep my /home in a separate partition, which leaves me free to migrate without losing my data or application settings. Installation was pretty fast as usual and it took me just under 20 minutes to get my system running again. "Data Services are about providing a convenient mechanism for providing a service interface to data stored in a relational database, Microsoft Excel files, CSV files or JNDI data sources."